The Ramban is an acroynm for Rabbi Moshe Ben Nachman and in English Nahmanides known in English as Rabbi Moses ben Nahman Girondi. 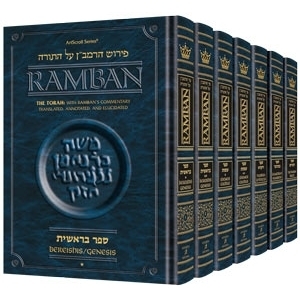 Ramban was a leading medieval scholar, Spanish sephardic Rabbi, philosopher, physician, kabbalist and biblical commentator. He was raised, studied, and lived for most of his life in Girona, Catalonia, Spain. He is also considered to be an important figure in the re-establishment of the Jewish community in Jerusalem following its decimation at the hands of the Crusaders in 1099. Now listen to the correct and clear explanation of the verse in its simplicity. The Holy One, blessed be He, created all things from absolute non-existence. Now we have no expression in the sacred language for bringing forth something from nothing other than the word bara (created). Everything that exists under the sun or above was not made from non-existence at the outset. Instead He brought forth from total and absolute nothing a very thin substance devoid of corporeality but having a power of potency, fit to assume form and to proceed from potentiality into reality. This was the primary matter created by G-d; it is called by the Greeks hyly (matter). After the hyly He did not create anything, but He formed and made –things with it, and from this hyly He brought everything into existence. and clothed the forms and put them into a finished condition. His exposition, intermingled with aggadic and mystical interpretations, is based upon careful philology and original study of the Bible. As in his preceding works, he vehemently attacks the Greek philosophers, especially Aristotle, and frequently criticizes Maimonides‘ Biblical interpretations. Thus he assails Maimonides’ interpretation of Gen. 18:8, asserting that Maimonides’ preferred understanding is contrary to the evident meaning of the Biblical words and that it is sinful even to hear it. While Maimonides endeavored to reduce the miracles of the Bible to the level of natural phenomena, Nahmanides emphasizes them, declaring that “no man can share in the Torah of our teacher Moses unless he believes that all our affairs, whether they concern masses or individuals, are miraculously controlled, and that nothing can be attributed to nature or the order of the world.” See further on this debate under Divine Providence.